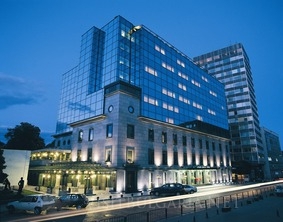 Grand Hotel Sofia is the newest 5- star hotel in the capital of Bulgaria, situated on one of the main streets of Sofia “Gurko”. Location: The Hotel has a wonderful view towards the City Garden, the National Theatre “Ivan Vasov” and the City Gallery and is within a walking distance from “St. AlexanderNevski” Cathedral, as well as the main administrative and financial center of Sofia. Grand Hotel Sofia disposes of 109 spacious rooms and 13 luxurious apartments. Hotel Facilities: Grand Hotel Sofia is equipped with hairdressers studio, 24- hour room service, dry cleaning and laundry, indoor parking lot, boutique and sale of luxurious accessories and souvenirs. Room facilities: modern air- conditioner with individual adjustment of temperature and humidity, direct telephone line, Internet connection, satellite TV, upholstered furniture, writing desk, mini- bar, private safe, bathroom with shower, bath- tube and hair- drier. Food & Dining: The luxurious Restaurant “Shades of Red”, offers selected wines and refined local and International dishes. The pleasant garden of the Viennese Grand Cafй serves aromatic coffee and cakes. The Executive Lounge offers elegant place for business meeting or rest and rich choice of refreshments, fruits and drinks, newspapers and magazines. Sport Facilities: The sports center offers fitness hall, sauna, solarium, Jacuzzi, special training programs, massages. Meeting Facilities: The Congress Center provides four multifunctional conferment halls with capacity of 10- 200 people. The hotel also offers computer room, library and a modern Business center with consultant, secretarial and courier services.